Importance Of Meeting Fire Codes Is Underlined By The Lessons Of The Tragic Grenfell Tower Fire In London, Says Fire Protection Group, Inc. The Los Angeles-based consulting firm comments on a recent column that, while fire code compliance is a must, owners and managers should be fully cognizant of the reason for the codes. The Grenfell Tower fire in London killed at least 80 people and is one of the worst fires in the recent history of the UK. Owners and managers of both business and residential properties need to not only fulfill the letter of the law when it comes to compliance with fire codes, they should reflect on the reason for those codes. 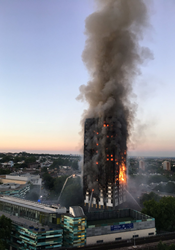 An August 18 column in the Pasadena Star-News discusses the idea of government regulation in light of the horrific Grenfell Tower fire in London, England; the inferno killed a minimum of 80 people in June, and rocked the British business and governmental communities. Columnist Larry Wilson points it out as an example of why even individuals who might be very skeptical of most government regulations should consider a different point of view when it comes to regulations regarding vital matters of public safety, such as the threat of a fire in a large residential building. Los Angeles based consulting firm Fire Protection Group Inc. says that owners and managers of both business and residential properties need to not only fulfill the letter of the law when it comes to compliance with fire codes, they should reflect on the reason for those codes: limiting the threat to human lives and property in the event of a fire. Fire Protection Group, Inc. adds that, while most people in charge of a property’s operations are extremely well-intentioned and ready to do whatever it takes to make conditions as safe as possible, doing so is a complex task that is best left to professionals. The firm adds that the numerous choices that need to be made while approaching the matter of fire safety are often difficult for laypeople to fully grasp. They note, for example, that few people outside the world of fire protection have even heard of such widely deployed products as a Viking sprinkler system or would know whether that brand would be the best choice for any given building. They add that different brands and designs of fire sprinklers, fire escape assemblies, standpipes (which bring water to the upper floors in a large, multistory building) have many different attributes, and it can take years of experience to follow understand the best way to deploy them. Fire Protection Group, Inc. says that it’s team is comprised of some of the most knowledgeable and respected members of the Los Angeles firefighting community; its lead engineer and general manager is George Saadian, a noted author and expert in the field of fire protection who has actually helped to revise many of the fire codes currently on the books. The firm adds that its roster also includes two highly respected veterans of the Los Angeles Fire Department: retired chief Al Hernandez and Captain Bob Holloway. When it comes to protecting a building from a fire, Fire Protection Group points out that good intentions are rarely enough, and having the benefit of genuine expertise is a boon. Interested readers who would like to learn more about how to protect a property and its occupants from the threat of a fire are invited to call (888) 251-3488. They can also visit the firm’s website at http://www.firesprinkler.com.